Additive manufacturing (AM) technologies have become integral to the modern manufacturing process. These roles are filled both in prototyping and production. Many studies have been conducted and lists been written on guidelines for AM. While these lists are useful, virtually none are written in a way that is accessible to novice users of AM, such as Makers. Most guidelines assume the user has extensive prior knowledge of the process, apply to only a few AM technologies, or describe benefits of the technology that novices already know. 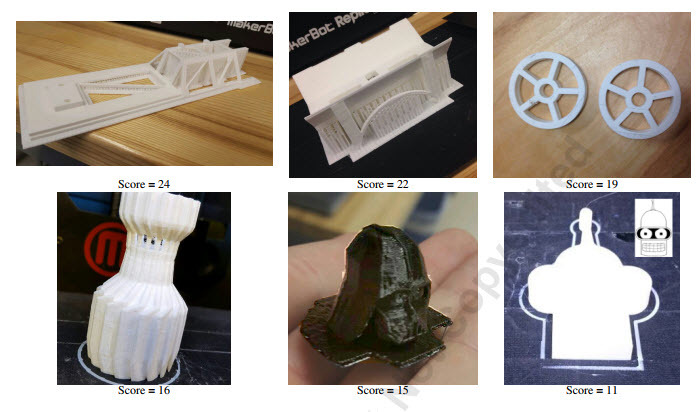 In this paper, we present a short, visual design-for-additive-manufacturing worksheet for novice and intermittent users. It addresses common mistakes and problems as identified by various expert machinists and additive manufacturing facilities. The worksheet helps designers accurately assess the potential quality of a part that is to be made using an AM process by giving intuitive feedback and indirectly suggest changes to improve a design. The immediate benefit of this worksheet is that it can help to streamline designs and reduce manufacturing errors. We validated it in a high-volume 3D-printing facility (Boilermaker Lab) where users are predominantly novice or intermittent. After the worksheet was implemented in the Boilermaker Lab, both the rate of print failures and reprinted parts fell roughly 40%.